We are so pleased that our friend Sylvie Cazes (Lynch Bages) has bought this estate near Cheval Blanc and we are confident that the rise in quality will be swift. This first vintage is very pretty with red fruit character, round and supple on the palate with fine tannins and a mineral finish. 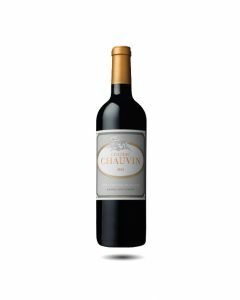 Sylvie Cazes' second vintage at Chauvin is a lovely one, full of charm and fruit. Made from a blend of 75% Merlot, 20% Cabernet Franc and 5% Cabernet Sauvignon, the wine was made using a cold and gentle extraction to preserve the fresh red fruit character. There is spice, fruit, good tannin and well-integrated oak here making this a very attractive St. Emilion which should age well but is already delicious to drink. Since Sylvie Cazes of Lynch Bages fame, bought this estate, she has made the wine fresher and more feminine and it is reflected in the pretty new label. The 2016 is a blend of 85% Merlot, 15% Cabernet Franc and 5% Cabernet Sauvignon. It has a dark, intense colour, a pretty nose of red fruit and smoke, good richness and structure on the palate with lovely spicy, black pepper and cassis flavours in the finish. Sylvie Cazes' tweede millésime op Chauvin is zeer mooi, één en al charme en fruit. De wijn is een 75% Merlot, 20% Cabernet Franc et 5% Cabernet Sauvignon met zachte extractie op koude temperatuur om het typische karakter van het frisse, rode fruit te bewaren. De wijn heeft tonen van kruiden, fruit, goede tannines en mooi vermengde eiken toetsen. Kortom een zeer aantrekkelijke Saint-Emilion die nog zeer goed zal verouderen maar nu reeds heerlijk is om te drinken.